Let’s close this series of articles on playing finger cymbals with some last words of advice. Do not bring your cymbals to a belly dance show unless YOU are performing! No one else wants to hear you play from your seat, or during open dancing. It’s like bringing your own guitar to a concert and strumming in the audience - it’s rude and inappropriate. Challenge yourself to learn a dance with finger cymbals that you can share with others as a real performer onstage, not an audience member begging for attention. Want to drive yourself and the audience nuts? Then play only one or two patterns over and over throughout your entire dance. Yes, I’ve seen that done, and unless you’re one of the Egyptian Ghawazee - or portraying one onstage - learn a few different patterns and incorporate them in your dance where they make sense. After all that’s why I’ve been writing these articles for the past couple of years! Don’t bother with cheap cymbals, even to practice with - they sound terrible. A good, brand-new starter set can be found for around $20. Don’t skimp on the price, because cymbals last for years and years, and certainly no one wants to hear thin, clanking, un-tuned cymbals for even a few minutes! For heaven’s sake, this is one of my pet peeves! When it’s time for cymbals in class, sometimes I just sit down and take a break while I wait for everyone to get them on. Frequently I’ll give my students a 30-second time limit to put them on, but honestly that’s still too long. 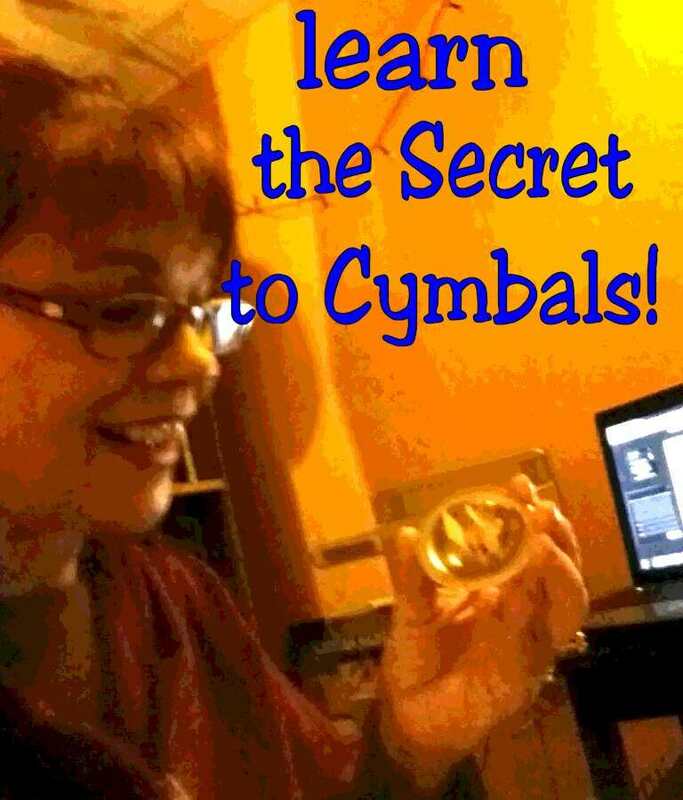 After a few months of playing cymbals it shouldn’t take longer than 10 - TEN - seconds! I’m klutzy with my fingers, but even I can get cymbals on this quickly. Also, “quickness” is the reason we decorate cymbals with paint, nail polish, beads on the elastic, etc. – so that we can pick them up and quickly - I repeat, quickly - know which digit they go on. Don’t bother with different color thread on the elastic, that may not show up in the backstage darkness. Have you noticed I call these little pieces of metal “Finger Cymbals”? That’s English for sagat (Arabic) or zills (Turkish). If you dance in the Turkish style then of course call them zils, but if you dance Arabic style, why would you? Use the correct term sagat or, if you speak English, finger cymbals. This is especially important when you’re dealing with Middle Eastern people (club managers, clients, etc. ), get the picture? You want to impress them, but with your expertise, not ignorance. Using the wrong term is just kind of sloppy. Yes, playing finger cymbals can be difficult. But almost everyone can learn to play them. Take the challenge of learning this amazing skill, it’s so worth the effort. Learning to play them helps you become aware of tempo, timing, rhythms, not to mention arm positions! Your dancing will improve because of them, just a few minutes a couple of times a week. You have my step-by-step videos to learn with so there’s no excuse! As always, I welcome your comments and questions on these articles or the videos on my YouTube channel. Good luck!